A 64-foot stone tower with a wooden lantern was erected at the west side of the harbor entrance in 1761, paid for by money raised by selling lottery tickets. New London Harbor Light was the fourth lighthouse in North America and the first on Long Island Sound. A tax on local shipping helped pay for the upkeep of the tower. In 1801 a new 89-foot stone lighthouse with a cast-iron lantern was completed by Abisha Woodward of New London, along with an oil house and cistern building at a total cost of $15,547. 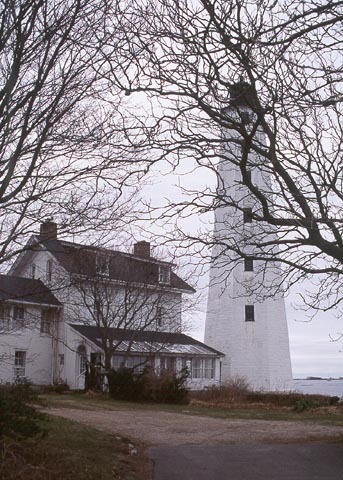 The handsome octagonal brownstone tower still stands and is the oldest existing lighthouse in Connecticut. New London Harbor Light was extinguished during the War of 1812 at the request of Commodore Decatur. With the militia nearby the British decided not to raid the lighthouse, but they did raid Little Gull Island Light farther out in Fishers Island Sound. A new keeper's dwelling was built in 1818 for $1,200. The present keeper's house was built in 1863 and was enlarged in 1900. 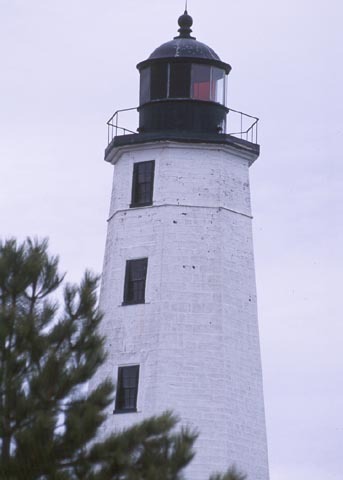 In 1857 the lighthouse's lamps and reflectors were replaced by a fourth order Fresnel lens, and this lens remains in use today. Today New London Harbor Light can be seen from Pequot Avenue but the grounds are not open to the public. Excellent views of the lighthouse can be obtained from many of the boats leaving New London, including ferries to Fishers Island, Block Island, and Montauk, Long Island. The grounds and the keeper's house is privately owned and closed to the public. In fact, there are alot of trees and shrubs at the edge of the property making it very difficult to see from the road. Also, there are signs saying "No photographing". Well, as you can see we, ummm, well... we sort of ignored the signs. Try to respect the owner's privacy if you can. But if you can't resist snapping some pictures of the lighthouse, make 'em fast. From Route 95 south take exit 82. At the end of the ramp take a left onto Route 85. Stay on Route 85 (Broad St) for 1.1 miles then turn right onto Route 1 (Colman St). In 1.2 miles, Route 1 goes to the right. Turn left onto Bank St. In 0.1 miles turn right onto Ocean Ave.
Stay on Ocean Ave for 2.2 miles then turn left onto Glenwood Ave. In 0.2 miles take your 2nd right onto Lower Blvd. Take Lower Blvd to the end then turn left onto Pequot Ave.
New London Harbor light is up the street on the right. Head to the small beach to see New London Ledge off in the distance.